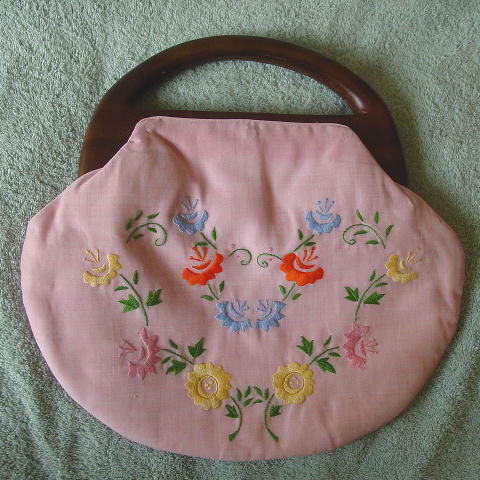 This vintage pink fabric custom-made purse has wooden handles and a separate white fabric lining. 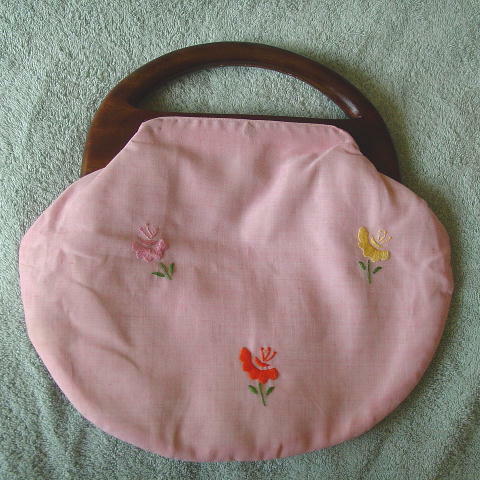 The upper pink fabric (front and back) has 3 snaps on each side which snap on to the white lining (the pink extends about 1/8" above the white). There is a small interior open pocket. The embroidered flowers and leaves are in baby blue, yellow, orange, baby pink, and green. The wooden handles are hinged and the wood is a little lighter in color than it appears in the pictures. There is a little darkening to the upper lining, probbly from pressing against the wood handle bases. It's from a former model. It was a birthday present from her then-mother-in-law. She loved the purse, but only used it once. She sold it because she's finally getting a divorce, and doesn't want to ever see or think about her ex-mother-in-law again. center handle handspace opening 1 3/4"
top handle to top of fabric 2 1/2"